NRA files lawsuit over ban on assault weapons in Mass. 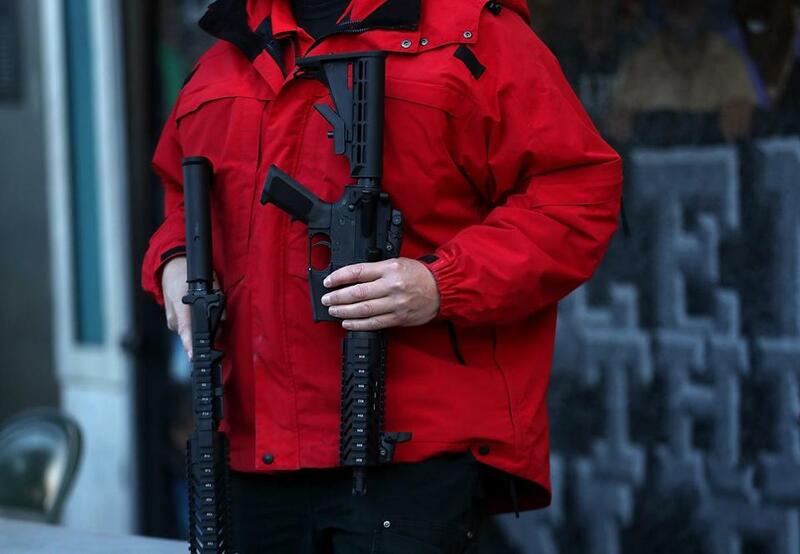 A San Francisco police officer held two surrendered assault rifles during a gun buyback event in December. In the lawsuit, the plaintiffs seek to have a federal judge declare both the state’s assault weapons ban, first passed in 1998, and Healey’s July action unconstitutional. Jay Porter, a lawyer for the plaintiffs, who also include licensed gun dealers and owners in Massachusetts, said the suit was filed in response to what he described as heightened animus toward legal gun ownership in the Bay State. The other defendants declined to comment. Healey angered gun rights groups this summer, when she said her office was cracking down on what she termed a loophole that allows customers to circumvent the assault weapons ban by buying “copies” of illegal guns. She sent a directive to all gun manufacturers and dealers in Massachusetts advising them that assault rifles which have been slightly modified in their bid to pass legal muster — such as the removal of a flash suppressor or featuring a fixed instead of a folding stock — should still be considered illegal because they are functionally identical to the banned weapons. Days later, a bipartisan group of more than 50 legislators wrote Healey to oppose the move. In a separate letter, Public Safety and Security Secretary Daniel Bennett, a defendant in Monday’s lawsuit, wrote that Healey’s action had created uncertainty and that people across the state might not be able to figure out which guns are legal and which are not. John Rosenthal of Stop Handgun Violence, a Newton-based advocacy group, criticized the lawsuit. In 1998, Massachusetts passed a law that mirrored a federal assault weapons ban passed in 1994. The federal ban expired in 2004, but the Bay State reaffirmed its ban that year. Monday’s federal lawsuit is not without precedent. Gun rights advocates have previously filed similar complaints in New York, Connecticut, and Maryland. Striking down the Massachusetts ban would give gun owners “the exact same level of right to own one of these firearms that the vast, vast majority of millions of Americans all over the country — to own the same firearms everyone else does,” Porter said. “It restores the Second Amendment rights of the citizens of Massachusetts to those enjoyed by the vast majority of other American citizens,” he said. Joshua Miller of the Globe staff and Globe correspondents Dylan McGuinness and Jacob Geanous contributed to this report. Travis Andersen can be reached at tandersen@ globe.com.